Brett Luke | The Journal Gazette Brady Shaw of the Komets fights with Dimitri Osipov of the Indy Fuel for control of the puck during the third period at Memorial Coliseum on Saturday night. Rachel Von | The Journal Gazette The Komets' Craig Cescon waits for the puck at Memorial Coliseum. Brett Luke | The Journal Gazette Cody Sol, of the Komets, takes a shot against the Indy fuel during the third period at Memorial Coliseum Saturday night. 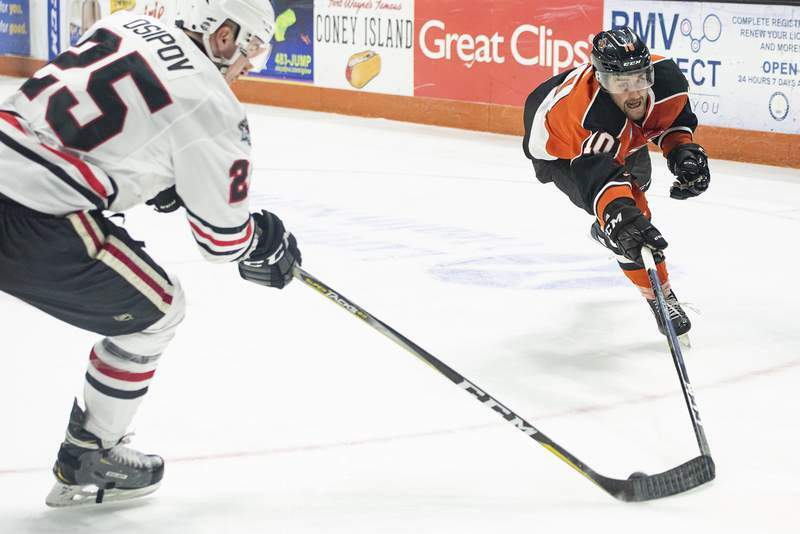 Perhaps more than any other time this season, the Komets are proud of the hockey they've been playing. Not just because they've been winning – three straight games – but because of the way they've done it. They've been good defensively – allowing four goals in those games – doled out body checks and gotten contributions from everyone. The evidence is what Taylor Crunk did last weekend. In a 2-1 victory at Western Conference-leading Cincinnati on Jan. 4, he opened the game by fighting Anthony Florentino and set a screen on Trey Phillips' game-winning goal. 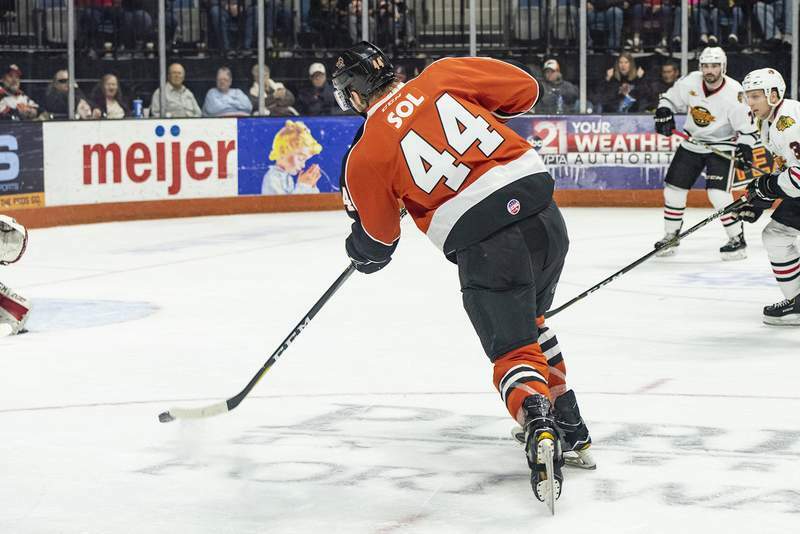 And in Saturday's 3-2 victory at Memorial Coliseum over the Indy Fuel, Crunk absorbed a crushing Dmitry Osipov check as he dropped a pass for Hodgman that set up a first-period goal. “I skated with Crunky all summer and I've said this before: he's got so much untapped potential. He brings that grit that none of us can bring and it's unbelievable, great for us,” Hodgman said. The Komets (19-14-1) are in third place in the Central Division, 10 points behind Toledo, heading into tonight's game in Indianapolis against the fourth-place Fuel (19-16-0). 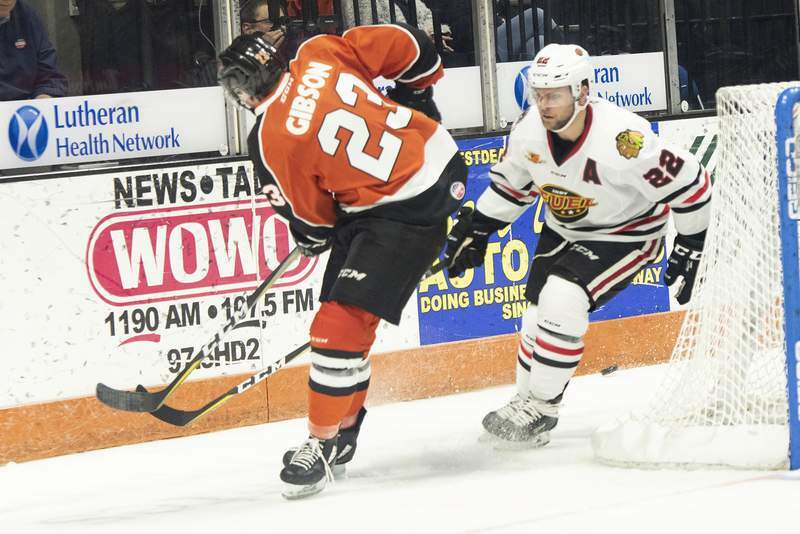 While consistency has been an issue for the Komets this season – they'd play a bad period or let down after scoring a big goal – those weren't issues over the last three games, and coach Gary Graham would like to see the intensity continue. “We've just got to play desperate and we've got to play physical. We're finishing a lot more checks. (Craig) Cescon is really leading the way with a lot of the physical play, hammering everything,” Graham said. There will be changes to the lineup today, though, since the American Hockey League's Chicago Wolves have called up Zach Fucale, the ECHL's reigning Goaltender of the Week, and sent down forward Matthew Weis. 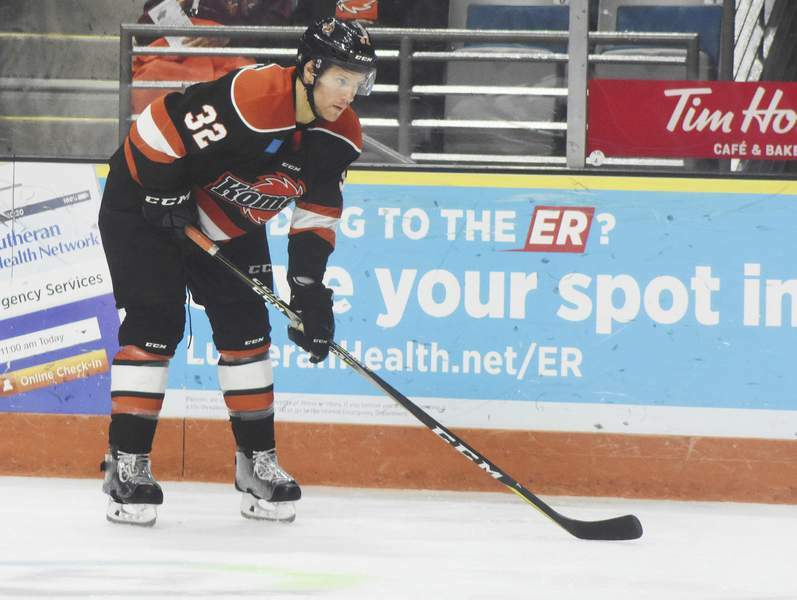 From a forward perspective, this could be the deepest the Komets' roster has been all season, though Phelix Martineau remains with Laval of the AHL. As for who will back up goalie Lukas Hafner, Graham said an announcement will come today. Hafner is 9-8-2 with a 2.68 goals-against average and a .903 save percentage. “I think when you're getting good goaltending and guys are selling out, blocking shots and playing desperate, that's how you slowly build the type of team that you want to have that's playing the right way heading into the later parts of the season,” Graham said.